Ø You can present either a paper or an electronic voucher for this activity. Ø For most of the year it is hot when exploring the temples. Ø The guide will make regular stops where you can purchase water and snacks. Ø Complete Operator information, including local telephone numbers at your destination, are included on your Confirmation Voucher. Our Product Managers select only the most experienced and reliable operators in each destination, removing the guesswork for you, and ensuring your peace of mind. Ø For a full refund, cancel at least 24 hours in advance of the start date of the experience. 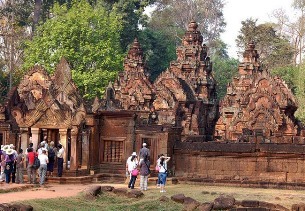 Ø Angkor Temples Small-Group Tour is $290.00. Ø Give availability on your preferred travel date. Our pricing is constantly updated to ensure you always receive the lowest price possible - we 100% guarantee it. Your currency is set to USD. This tour is designed for those who want to combine the best of the temples, with Siem Reap other attractions. This is a flexible tour giving you the structure of an itinerary, but allowing you to set your own pace. This is based on your purchasing a 3 day temple pass. Start at 08:00am, driver and tour guide will pick you up from your accommodation to the 65Km sprawling jungle temple covering over one square kilometer, Beng Mealea, is largely overrun by vegetation and very lightly tourist, giving it an adventurous lost temple feel photographers. We work closely with you to discuss about your lunch stop at the local restaurant. On the way we will stop at Kampong Phluk, floating village, Tonle Sap Lake. It is the largest lake in South East Asia. Start at 08:00am, driver and tour guide will pick you up from your accommodation to purchase a 3 day temple pass to visit the ancient city of Angkor Thom (South Gate Angkor Tom, Bayon, Baphuon, Phimeanakas, Terrace of the Elephants, Terrace of the Leper King, North Khleang, South Khleang). Then visit some small temples on the small circuit like Chau Say Tevoda, Thommanon, and Ta Keo. Then head to the jungle temple Ta Prohm. It is where they shoot the movie “Tomb Raider”. Your guide and driver will discuss about your lunch stop at the local restaurant. After lunch break, visit the Buddhist temple Banteay Kdei. It is the best time to explore this incredible monument at your own leisure. And gain an insight into the Khmer Empire, Angkor Wat. Then head to wonderful sunset at Phnom Bakheng. We suggest an early start today at 05:00am; driver and tour guide will pick you up from your accommodation for sunrise at Angkor Wat. Follow by a visit at some temples on the way like Pre Rup, Banteay Samre. Then head to the 37Km temple, Banteay Srey, before the masses of crowds arrive. The most intricately carved temple in all of Angkor. Enjoy traditional Khmer village and palm sugar production. There is an opportunity for those who interested to visit the Landmine Museum. The admissions fee to this site is $5/person. Your tour guide and driver will discuss about your lunch stop at the local restaurant. On the way back, there are few more temples to visit like East Mebon, Ta Som, Neak Pean and Preah Khan. 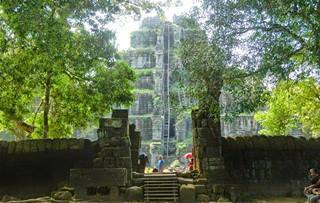 Preah Khan is a huge, highly explore monastic complex. Your trip out takes you through local villages providing some fantastic photo stop. Note: Please ask your accommodation for the breakfast box if you like to keep your temple visit in the morning or you may have your breakfast at the local restaurant nearby the temple. But if you are happy to return to your accommodation for your breakfast then return for your temple visit after, we are happy to return for free of charge. Note: At the end of the day, we will bring you to your accommodation or you may request to drop off nearby the city.